Dear BMW k75's owner who wants to modify it into a modern retro beast, welcome ! It would sound stupid but don't solder immediately, use a lot of electrical dominos, once everything works, then you can solder. Work step by step, and as my technical teachers told me, "You should test 3 times and do the piece one time than the contrary" it was something like that but nevermind you should understand me. Well, first of all you should have to build a small electrical circuit for the neutral light, that way you wouldn't have to pull the clutch to start the bike if it's in the neutral but of course yes if a gear is engaged. Without it you would be able to start the bike even if a gear is engaged, quite dangerous in my opinion I wanted my bike to start like every other bike. So here is the circuit : The size of the circuit is approximately the same width of a King Size condom, smaller than a credit card if you prefer. The idea is to print the PDF just bellow on scale 1, then taped a piece of plastic like bakelit for example on it and the pierced all the small hole. Then place your componants and solder every wires with the componants like in the schema. I fail to build a real PCB with copper plate so I used electrical wire instead, it's perfect, more tricky but perfect. If the link is disabled with the time, search a relay with the same characteristics but you should redo the wiring like I did. 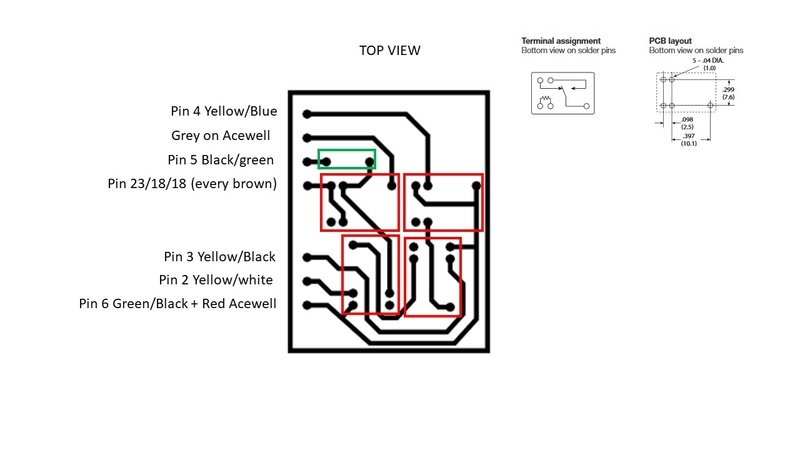 Attached to this message, you will find my pdf of the neutral circuit with top view to place the componants like the picture upward + the bottom view of the neutral circuit to solder the wire. 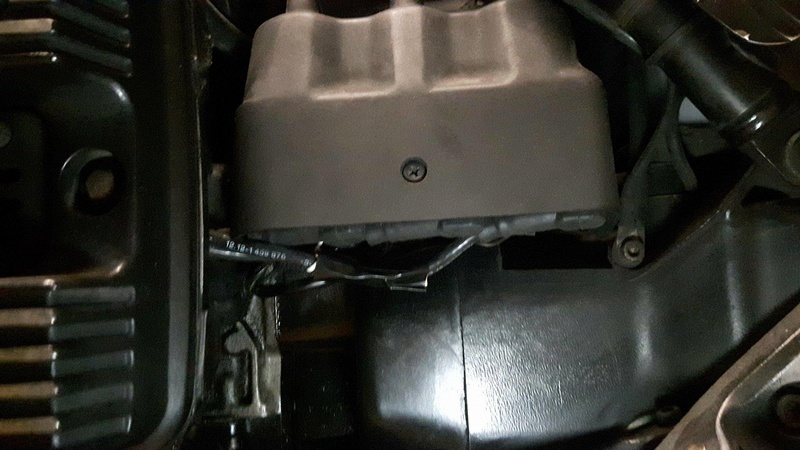 To get the rpm on the Acewell, you should take an electrical wire, turn approximately 5 times around the cable of the 1st ignition coil (when you stand in front of the 3 ignition coil, it is the one at the right). The more turn you have, the more stable the signal will be. Then the wire can go below the fuel tank with all the electronic (it is were i put the neutral circuit), then you should add à 1Mohm resistance to get the signal more stable. For that I built a small circuit with the wire from the ignition coil going to on side of the resistance and another wire from the other side of the resistance to the Acewell. As you can see, I turn the wire several time around the cable then taped it with very strong tape, it's discret (here the cable is out for the picture) and it works perfectly. Then you configure your acewell for the number of cylinder as explain in the Acewell instruction paper. To have the speed on your Acewell, you can use the system provides with the Acewell. You have the screw with the wires and a little magnet with a thread. So I build a piece of metal. I folded it with the good shape and fix the screw with the wire on it. Then I fix the support of the screw with the wire on the end of the forks with the 2 screw that tighten the axe of the wheel. Then I pierced the support of the brake disk,threaded the hole and screw the little magnet. Because nothing worse an exemple, here you have bellow a very basic schéma of the system. The piece that I built is red, the Acewell speed system is blue, the disk brake and its support is orange, the rim is brown, the fork is dark grey, the axe is light grey. Done in steel and protected, this system is very solid, not so much difficult to realise, and do the job very well. You can attached the wire to the fork, then through the original mudguard for exemple and direct to the Acewell. You will receive with your Acewell a chart with dimension code of your wheel and the circumference associated. Just enter the good circumference in the Acewell menu and it's done. There is an alternative : to reuse a circuit from the original k75 speedometer. I'll don't explain how, because I didn't follow that option (I wanted to sell the original speedo) and I'll don't talk about something I don't know while many people explain how in other forum/topics in the web. Anyway, you know an other option exists, more discret but you would have to make your original speedo out of order. As you prefer ! 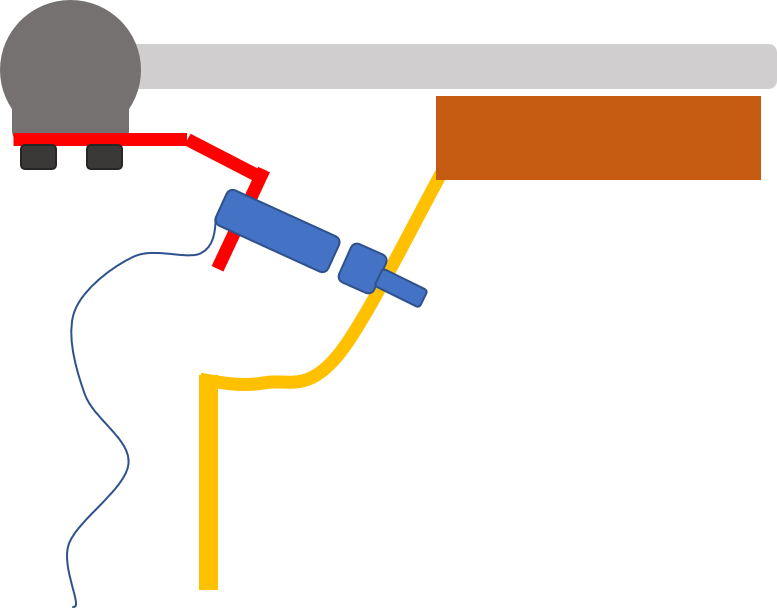 Use the yellow wire for speedo (not the grey wire). No circuits need building, no resistors, no electrical song and dance. Plug and play. It's just a matter of choice after all, you have the same result at the end but not at the same price and not with the same competences ! I applaud the effort involved, and you certainly learn more doing it the hard way.